Langtang Helicopter trek for senior citizens or family with kids. The trek is suitable for senior citizens and family with kids. Avid trekkers can climb Yala peak or Cherko Ri above 5,000 m within a week’s time. Langtang valley is the closest trekking route from Kathmandu. The region is less travelled and sustains authentic Tibetan Buddhist Sherpa culture just next to Tibetan border. However, the drive to trail head is tedious and the first few days of walking is tiring with ups and downs on the rugged trail. The 4 days Langtang Heli trek allows visitors to avoid tedious drive and the walking in the foothills. The helicopter flies right into the scenic part of the valley from where the walking is easier. 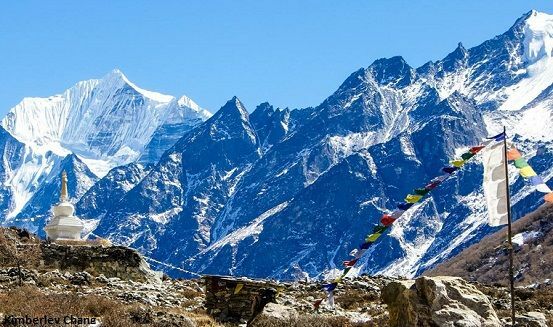 Within just 4 days from Kathmandu, one can enjoy the Himalayan view from Kyanjin Gompa, climb Kyanjin Ri (4,773 m / 15,655 ft) or Cherko Ri (almost 5,000 m). With couple of extra day, avid trekkers can also climb the Yala peak 5520 m.
4 days trekking package with all meals and teahouse accommodation. Trekking with a guide and porter. Guided sightseeing around Kathmandu with all entrance fees included. Attractions : Less touristic trek suitable for seniors and family with kids. A week long trek with climbing to 5000 m for avid trkkers. Grade : Easy to Moderate gradual climb in the altitude above 3,000 m. Everyday walking is about 4 hrs. Our represent will meet you outside the Kathmandu airport. Drive 35 km / ½ hrs to Dhulikhel. Dhulikhel is a hill station at 1,500 m in the eastern rim of Kathmandu valley. Stroll through the charming village to the sunset view point and back to the Hotel. Sunrise view over the eastern Himalayas from Dhulikhel is breathtaking. After breakfast, drive 2 hrs to Nagarkot hill station at 2,000 m and walk for about 5 hrs to Changunarayan. Changunarayan is the oldest existing Pagoda style Hindu temple dating back to 3rd century. The premises has beautiful stone sculptures from around 7th century. Drive back to Dhulikhel. Visit Bhaktapur on the way. Bhaktapur is known as living museum for it still retains age old Newari lifestyle intertwined with medieval architectures. Both Changunarayan and Bhaktapur are recognized as UNESCO as cultural heritage sites. Drive to the airport and take a Helicopter ride to the Langtang valley north of Kathmandu. The scenic flight takes about half an hour to land at Ghoratabala at 2,950 m. At this altitude, we are in alpine meadow surrounded by snow peaks. Walk 3 hrs to Langtang village at 3,330 m. Overnight in teahouse. DAY 5: Explore the Langtang valley. Cherko Ri (4,993 m) is option. There are several side trips and climbs in the valley. Climb to the Kyanjin Ri (4,650 m) takes about 3 hrs. Walk to the end of the glaciated Langtang valley to Langshisha Karka with pack lunch. If you still feel fit, climb Cherko Ri (4,993 m) for the 360° view of Snow peaks. Take a Helicopter flight back to Kathmandu and check in Hotel. Later visit Kathmandu Durbar square and Boudhanath. DAY 7: Drive to the airport for final departure. Chitwan National Park for custom make safari activities and relaxing stay in the wild and less touristic part of the jungle.